January is primetime for catching hatchery and some wild steelhead. 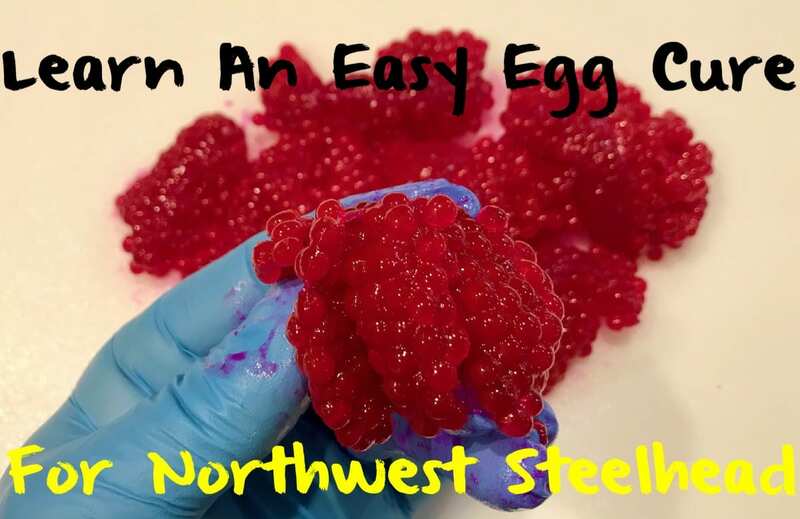 When curing eggs to catch winter steelhead in the Pacific Northwest I recommend keeping your cure simple, except for making it sweet because we all know steelhead have a sweet tooth. This is going to be a short and sweet blog. I keep it simple. The first step to producing quality bait/eggs is to take proper care of them no matter where you get them. Whether you are getting them from a supplier or retrieving them from fish that you have caught taking the extra step to keep them dry and clean before the curing process is a must in my mind. If you’re cleaning your fish riverside always carry Ziplocs and paper towels to keep your eggs protected. Once you get home you can begin the curing process. Depending on the size of the skein I start off by cutting my eggs into thirds or quarters. I do this to allow the cure to penetrate through the eggs. Once you cut the eggs use whatever container you prefer. Some use a Ziploc or Tupperware container (and later add the cure into). I prefer a Ziploc for the ease of tumbling and mixing the eggs once you have poured in the cure. Before adding cure I typically start with adding sugar. I don’t measure out the sugar rather pour enough to lightly dust the eggs. I believe in the old saying, ‘less is more’ when it comes to applying sugar. The sugar creates a more tacky, yet firm egg with a sweet scent. 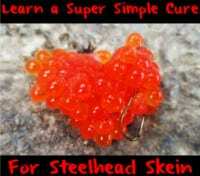 Steelhead have a sweet tooth from my experience. Once you have applied you sugar repeat with BorX O Fire color of your choice. I prefer red for my cure in dirtier water and will change to pink, orange and natural as the water clears. Next pour in Fire Brine (same colors from above apply). I typically poor enough to cover about a third to half of the eggs in the bag. The Fire Brine will help the borax and sugar to penetrate every nook and cranny of the skein. Once the cure and brine is in the bag gently tumble the bag in your hands to coat the eggs thoroughly. Lay the eggs flat in the refrigerator. Repeat the tumbling of the eggs in the bag every few hours to allow the liquid from the Fire Brine to penetrate in all the cracks of the skein. Allow your eggs to soak in this mixture for at least 48 hours. I have used them the next morning with as little as a 12-hour soak in the brine, but longer soaks create better eggs. At the end of the soak drain the excess liquid. Then pat the eggs dry and store in the container of your choice. I freeze until I’m ready to fish. *Special note: If using this cure just know I will not be held responsible for sore arms or excesses limits. Editor’s Note: Mike Ainsworth operates First Light Guide Service in Western Washington. 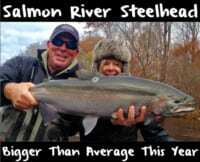 For more information on his guided steelhead trips please visit: https://firstlightguideservice.com.